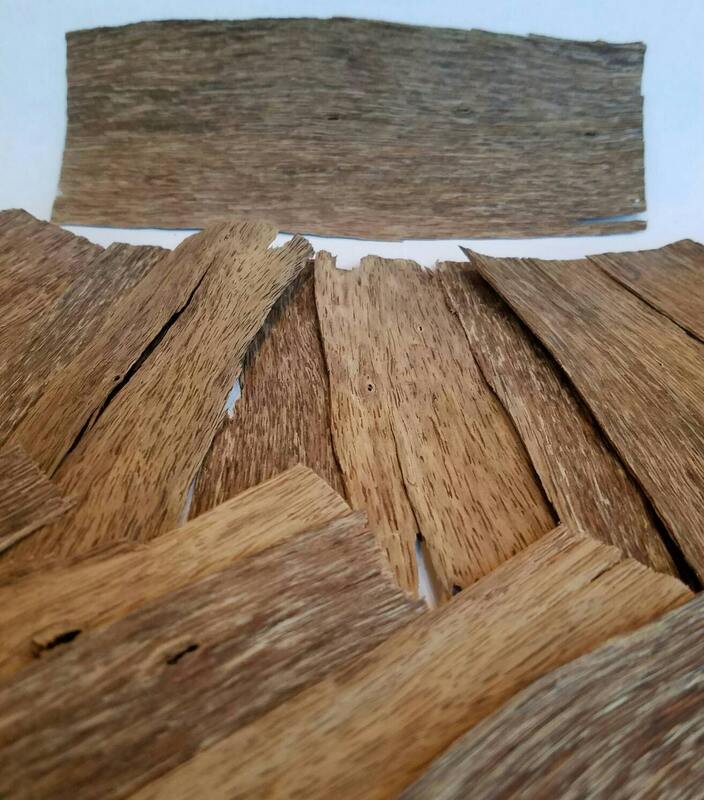 This Grade B Plantation Viet sustainable agarwood is very high quality, lots of resins, and visibly boiling when heated, though less than the higher grades. It exudes the most intoxicating smell of sweet forest breeze filled with the scent of sweet dark resins. More woody than the higher grades. The scent from burning only a very small piece will linger for quite a while in an enclosed space. 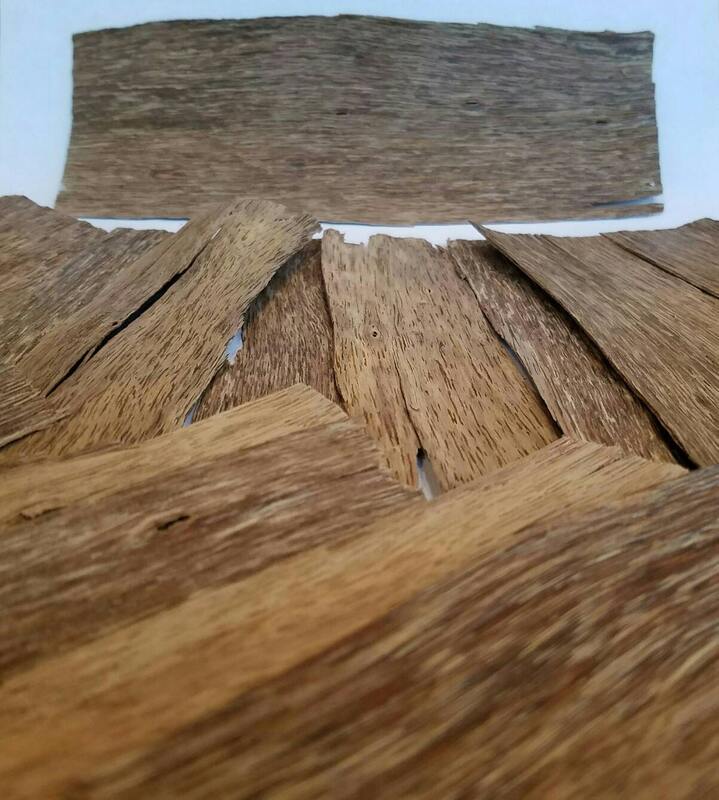 Grade B Plantation Viet sustainable agarwood from Vietnam(aquilaria crassna) is shaved into veneer like pieces that are 1 mm thick. Being so thin, it's very easy to snap a small piece off for burning, either with an incense heater, charcoal, or flame. When you do, you'll be amazed at how much resin starts boiling out, and the amount of amazingly fragrant smoke that comes off such a tiny piece. Agarwood has been used for thousands of years in incense and perfume and is written about in many ancient texts. Our sustainable agarwood will fill your nostrils with ancient feelings of peace and connection. Reminding you of the mystics of a forgotten time while also centering you in the present moment. Agarwood is said to be the strongest intention amplifier when used in your own rituals. Sustainable agarwood is the only kind of agarwood we sell here at Mystic Craft. Most agarwood available is from wild harvested trees, which are very endangered. Plantations have been popping up more and more, and we are in full support of that, leaving the wild trees and the forest to continue doing their thing in peace. Then maybe the population of wild trees can bounce back. In some places, people still go out and cut down wild trees just to get a small handful of incense wood. I have also heard of tribesmen finding an infected tree and harvesting some agarwood while leaving the tree to continue growing. To show both possible sides of wild agarwood. Agarwood requires some pretty specific conditions to come into existence. First, an aquilaria tree has to grow to a good size. Then, it has to get a particular parasitic fungus in a wound or opening around a branch. After it's infected, the tree concentrates its resins around the site to fight off the fungus. 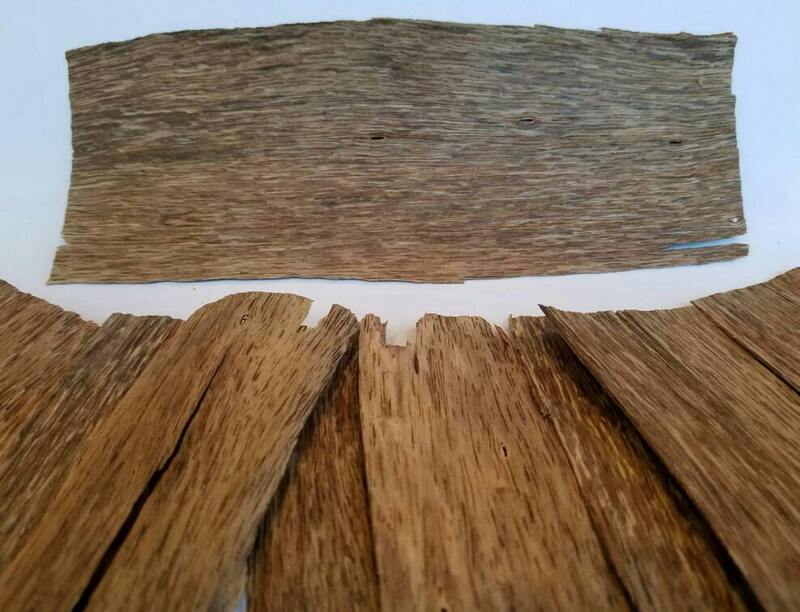 After some time concentrating resins, the wood changes from an almost white, lightly colored wood, to dark brown, almost black in the highest grades, such as sinking grade. Only a small amount of the trees wood is darkened and resinated though. And only around the infection, making it very hard to come by in the wild. Agarwood is also the source of Oud oil, or agarwood oil. Through steam distillation of the powdered wood.